Last weekend Jane and I officially embarked on the path towards marriage because we attended…a Bridal Expo! We trekked over to join a bevy of brides, bridesmaids, mothers-of-the-brides and a few sheepish grooms as they prepared for the special day. There were about 70 different exhibitors on show from jewellery to wedding invitations to teeth whitening and even fitness training. With most of our own major wedding items in place, Jane and I were there for more of the novelty value than anything else (and I was certainly on the lookout for material for this reflection). Of course the main question asked at each stall was ‘when is the big day’ and we had some gasps of horror when Jane let them know it was December this year and not December next year. One of the stalls was promoting a new wedding planning app in which the couple can enter the basic details about their wedding and receive an email showing the approximate cost of the wedding, according to industry averages. So we had a go and filled out the few questions asked: date of wedding, style of wedding, number of reception guests, type of honeymoon etc. The email we received sent me into shock. It informed me in no uncertain terms that my wedding to Jane, with 150 guests at the reception, was going to cost $105,936.09! This included $20,000 in outfits, $4500 in decorations (including $550 of balloons…not sure where they are going), $42,000 at the reception and $25,000 of pre-wedding expenses. Maybe this is the ‘industry average’ for a wedding, but if so, we all need to take a good hard look at ourselves and ask when exactly it became acceptable to spend more than a year’s wages on an event that is going to take less than a full day. Just imagine if couples were willing to put a similar amount of efforts and finance into the development and growth of their marriages after the wedding day (I noticed that nowhere in the pricing breakdown was there an item for marriage preparation sessions). Our own wedding is going to come in much less than that amount and I know couples who have held a wedding and reception in recent years for under $10,000. Of course the truth is the actual wedding in and of itself does not have to cost anything, it is all the frills we put around it that cost. 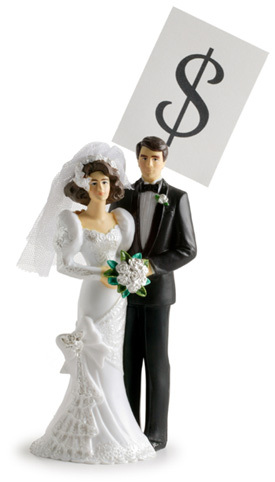 I am certainly not against a couple creating a memorable and beautiful day but to let couples think that it is normal to spend $100,000…well no wonder people say they can’t afford to get married! Especially vulnerable in this whole wedding industry fiasco is the bride, who is conditioned over a lifetime to believe that her wedding day is almost the pinnacle of her existence as a woman. As my mother is fond of saying, your wedding day should not be the happiest day of your life, that is, it should be everything that comes after the wedding day. Agonising over what style of bow will be placed on the chair covers is hardly a healthy pastime for any person. A wedding is a wonderful event but it is merely the start of the journey. When someone leaves for an overseas trip they don’t spend more money on the farewell than they do on the trip. Being immersed in wedding planning myself I can see the temptation to get pulled into micro planning but it is really something that a couple need to keep being aware of. Perhaps these wedding expos might be more realistic if they included a few stalls on the meaning of marriage, marriage preparation and raising children; it might remove some of the fairy dust seen floating through the air at these events. To show however that I am not completely anti-wedding planning I can announce one good thing that came from the wedding expo…we found a company that can put on our chair covers for half the cost of what we were going to pay and they assure me the bows will look spectacular! Posted in Uncategorized and tagged average wedding cost, bridal expo, engagement, how much does a wedding cost, marriage, proposal, wedding, wedding expo, wedding industry. Bookmark the permalink. I find the purpose of a wedding is to make others, mainly the guests, feel comfortable and well fed. The only thing the bride and groom need to do is say Yes and smile for a photo. Most of the expenses goes towards keeping Aunt Gladys and Grandpa Norman and friends happy. How many children to have?